West Village niche perfume boutique Aedes de Venustas has launched their second fragrance, Iris Nazarena, or their third, if you count the earlier Aedes scent for L'Artisan Parfumeur. Iris Nazarena follows last year's Aedes de Venustas Signature, and I think we can now safely say a few things about the Aedes aesthetic: they like assertive perfumes — hey, meek and wearable are already adequately covered elsewhere, right? — and they like incense, and they seem to know what they're doing when it comes to perfume development. Of course, Chanel No. 19 might be the benchmark, but it's not really my benchmark — my question is the point of difference with my longtime iris staples, namely Serge Lutens Iris Silver Mist and Hermès Hiris — and by the way, does anyone wear Hiris anymore, other than me? And then there are my many secondary iris loves, from Chanel 28 La Pausa to Prada Infusion d'Iris (the Infusion d'Iris Absolue variation is probably my most-worn iris these days) to By Kilian Prelude to Love, and on and on and on. I'm happy to say Iris Nazarena is different enough, and wonderful enough, to join the group. It opens with bold, dirt-caked roots, earthy and dry, and grey enough to justify the bottle color (see below) — it's almost as though it starts with the base notes and then moves on from there. But the heart does take on some lift, first from the juniper berry and star anise (other notes: ambrette, leather, oud, clove, rose de mai, incense, woods, musk and vetiver), which seem to lighten the load, and then from the sheerest of floral rose notes (you won't notice it unless you look for it), before it descends, again, into a dusky blend of earthy-leathery notes: vetiver, a touch of dark woods, a bit of incense, a very smooth suede, with the iris quieter now but still very much in evidence. It probably sounds heavier than it is; it isn't a light fragrance, but nor did I find it overwhelming in the heat and humidity we're having here lately. It's probably not really what I'd reach for on the hottest of summer days, but you could certainly wear it most of the year. Like Iris Silver Mist, it isn't going for pretty, and if pretty is what you're after, be likewise warned that while it's unisex, it probably tips the scales towards masculine. Verdict: This is as good a place as any to insert my disclaimer — Aedes is a long time advertiser at Now Smell This, so do keep that in mind.1 Ya'll know you should never buy unsniffed anyway, right? Despite that, I think Iris Nazarena is beautifully done. It's as likely to appeal to fans of woody leather as it is to iris fiends, but it's unusual enough to be a must try for anyone who collects iris. If it came in 15 or 30 ml, it would be on my buy list. The quick poll: name your favorite iris fragrance, or go ahead and tell us what you have against iris perfumes. 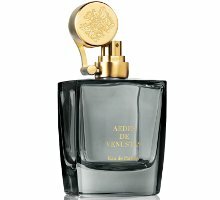 Aedes de Venustas Iris Nazarena is available in 100 ml Eau de Parfum, $245. For buying information, see the listing for Aedes de Venustas under Perfume Houses. 1. Just to clarify, we don't take direct advertising from perfume brands for precisely this reason — I'd rather not be in the position of reviewing products made by our advertisers. Since some retailers have started introducing their own branded perfumes, and since I also don't want to ignore great fragrances, which are after all few and far between, here we are. But I will readily admit that if I didn't think Iris Nazarena was wonderful, I probably wouldn't review it at all, so in that sense, I think you can say that this isn't a totally objective review, if such a thing indeed exists. How funny; 19 is my benchmark for green, not iris. I love iris, but have yet to find The One for me yet. I like Iris Poudre very much, as well as DelRae’s Mythique and 28 La Pausa. La Pausa might well be It if it lasted more than seconds on me. I’d love to try some Hiris and Uncle Serge’s, but Lutens never work for me and I haven’t been able to find the Hiris anyhere to sample. The lasting power of 28 La Pausa really is a drawback. Have you tried the Prada Absolue? Me too wishes 28 La Pausa lasted longer. Robin has a good point as Prada Absolue smells quite similar and it doesn’t have longevity issues. I need to get that Prada for sure! No, and I’m not sure why, other than Prada items being rather thin on the ground in rural Arkansas, and I just never think about iris when I order samples from the decanters. Common sense tells me I should just claim my bottle of 19 as My Iris and be done with it, but where’s the fun in that? Ha, no fun at all. And No. 19 (which I adore) is *my* benchmark for vetiver. As in, any more vetiver than that and I’m going to be overwhelmed. My collection includes No. 19 in three different concentrations, but I too don’t think of it as my ultimate iris or even consciously register its “iris-ness” at all when I wear it. And Prada Infusion d’Iris, which I enjoy wearing occasionally, strikes me more as “flowery soap” than as iris. The most iris-y iris I own is Le Labo Iris 39, which is rooty and cleanly earthy enough to live up to the name. It’s my favorite iris scent and one of my favorite scents overall. Call me naive, but I still search and search for a fragrance that smells like a bearded iris flower. Kinda grape-like. Most of my searches have turned up fragrances based in iris (orris) root ingredients. 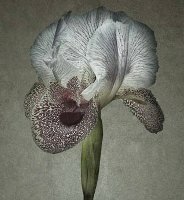 Some interesting discoveries but has anyone found something that recalls a real iris flower? I think my sample of Iris Nazarena will arrive tomorrow (it better will as I’m leaving for a week this Sunday). My favorite iris perfume at the moment is Carner Barcelona D600. There’s always a lot of place for iris in my collection, namely VC&A Bois d’Iris, Prada Infusion d’Homme, L’Artisan Parfumeur Iris Pallida and a couple more. Great review Robin, I can’t wait to try my sample! I own the VCA, but nearly never reach for it. Must figure out why. Definitely do figure it out, it would be such a waste to have a bottle of it neglected. Is Cuir de Russie an iris perfume? If not I would be torn between Iris Silver Mist and Apres l’Ondee. Well, I would call it a leather, but everybody should do their own sorting, right? Pre 80s CdR is leather, the new stuff iris (to me, at least). I have lots of favorite irises—Cuir de Nacre, VCA Bois d’Iris, Equistrius—and I like Iris Nazarena a lot. It reminds me a little bit, I think because of the incense, of the ridiculously expensive and impossible-to-find Armani Prive La Femme Bleue, but this is not as sweet, and there is something a little flinty or stone-like here that I really like. For as bold a scent as it is, though, it seems to get very sheer and quiet after an hour or so. Good to know, since I will almost certainly never try the Armani. I don’t ‘get’ iris fragrances because they tend to strike me as cold, if that makes sense. I think they strike a lot of people that way. The Aedes is almost certainly less cold than most, because of the leathery base notes. Cold or cool for me, yes very often. I like it! I have given Iris Nazarena a thorough try for a few weeks and my verdict is that it is going on my fb wishlist. What I find in it is very similar to how you perceive it, and while I don’t care for an iris that is quite as rooty carrot as Iris Silver Mist, Iris Nazarena is just enough root for my taste and sufficiently different from my other iris scents to have its own identity. Sillage is comfortable and it certainly has better tenacity than some of my other iris loves. ISM really is rooty carrot. Or turnip. Or dirty hair…surprised nobody has showed up yet to say iris smells like dirty hair, I know many people have that complaint. Glad you like the Aedes! A warm iris perfume is a rare thing, so this one is sounding quite interesting to me. My favorite iris is another warm one, Parfumerie Generale’s Iris Oriental, formerly Iris Taizo. However, when I’m yearning for a cool blue note, I still wear Hiris. I love it, too. So glad to see another fan of Hiris. I almost never see it mentioned these days. I love Hiris. I still wear it a lot and it is one of my top five favorite scents. Same! I don’t know what goes better with a crisp white button-up than a few spritzes of Hiris! I’m putting my hat in the “I don’t get iris” camp. I’ve tried several iris-centric perfumes, and they just don’t speak to me. They can be interesting, but it feels like an academic appreciation rather than that cozy, “I want this near me/on me” feeling I get from the scents I love. Like a really stark Japanese rock garden–beautiful but too cold or static and archetectural to make me want to linger. All that said, I’d sniff this if a sample fell in my lap. Maybe it would be the iris that finally won me over? There are plenty of notes I don’t get, so I have no complaints! I get that “rock garden” feeling from most incense perfumes: stark, cold, impersonal. I appreciate them, but don’t feel any great compulsion to wear them, and some of them turn downright off-putting on my skin (Tauer L’Air and CdG Avignon come to mind). But for some reason I can totally get on board with iris. It DOES give off an intellectual, cool vibe, but one that’s grounded and earthy rather than dank and esoteric. Plus, I agree with Chandler Burr (not a common occurrence) when he describes iris perfumes as “liquid good taste”. The best ones just radiate a certain chic; not staid, buttoned-up elegance, but smart, sharp style. Oh, I can completely see how incense could have that impact! I like incense as a note, but not the really dry, ashy ones. But if a warmer perfume has some incense lingering in the background, it feels familiar and friendly enough to me. Iris *does* smell tasteful and refined, and if I sniffed it on another person, I’d likely assume that they had generally good taste and are attentive to details of style! It never smells sloppy or just splashed on, like say a patchouli or certain BWFs can to me. It’s funny–I totally agree with the zen garden characterization, and that is what I like about them! Beautiful in a still, calming way. Even so, I readily admit it’s not what I’m in the mood for every day, so I can understand why others wouldn’t necessarily love it. Totally depends on what you’re looking for in your perfume, I’d say. I can see that! Clearly zen gardens have their regular visitors! I love Iris perfumes, and I have every single one of the Irises you listed and the collection is only getting bigger. I can appreciate the beauty of No.19, but never quite love it – possibly because it’s my mother’s signature fragrance, and me wearing it feels a bit like borrowing clothes that don’t fit me from her wardrobe. As for Iris Nazarena, I’m either not able to smell everything in the scent or my nose becomes sensitized to it really quickly. Given the track record of other Aedes perfumes, I’d expect this one to be heavier than it is. It is quite carrot-y to me too, and wears like a skin scent on me. I think this is my new favorite Iris! I have never been able to love 19 either, and I don’t have your excuse. I enjoy the rooty first whiff that I get from iris perfumes (Iris Silver Mist, Prada Infusion d’Iris) but after not long they smell so acrid on me that I want to wash. I was actually relieved to later read Turin’s updated review of Iris Silver Mist where he says, “a slightly sour floral base creeps up in the drydown,” which describes my impressions very well. But I do like Cuir de Nacre. So I guess for me, iris plus leather is the way to go. Interesting, I missed that review…is that his general take, or is he saying it’s been reformulated? He says (in The Little Book of Perfumes: The 100 Classics, 2011 update) that it’s reformulated (different): still good, but “thinner” and “less brutal”, “no longer the monstre sacre of yore”. Oh dear. Very sorry to know that. Oh well, maybe I’ll get lucky and forget all about it. Should have said — and thanks! 1) I still wear Hiris. Love it. 2)My favourite Iris? Probably ISM, but the one I wear the most is Infusion d’Iris. Not the Absolue which I didn’t like at all oddly enough. Other irises I like: Dior Homme, Equistrius, Love les Carottes, Iris Nobile, Bois d’Iris ( both the one by TDC and the VCA), Delrae Mythique, PG Felanilla, and I would like 28 La Pausa if it would last a little more than a minute on skin. Les Carottes is so wonderful…I can’t believe I forgot that one. AND I actually own it. I love iris, both straight up and mixed. Iris Silver Mist is my absolute favourite and in a way I think it has ruined me for other irises: nothing else seems quite enough. But I do enjoy La Pausa (yes, the lack of lasting power is terribly annoying), VC&A Bois d’Iris and Hermes Hiris a lot, too. And if iris blends are allowed, then I’ll add Cuir de Russie and Dior Homme. Well, anything with iris and leather, really. My sample of Iris Nazarena arrived a week ago and I’m still trying to figure it out. It’s a complex, interesting, bold iris, so I should love it, but… I’m not sure. Definitely worth trying, though: real, beautifully made perfume that doesn’t underestimate the wearer. Yes, I like the idea of “doesn’t underestimate the wearer” — we don’t get enough of those. I LOVE Hiris, and wear it often. It’s one of my bottles that has it’s own backup bottle, and I get a little panicky whenever I’m down to just one. It appears periodically on some of the online discounters. I would love to try Iris Silver Mist, as that rooty, carroty thing really appeals to me, so this sounds like one to sample! Good. Plenty of Hiris fans still around, looks like. I love iris, and Nazarena sounds like something tat I may like a lot — thanks for the great review! And I definitely also wear Hiris, and a lot! It it very hard to decide on the favorite iris (there are also Iris Silver Mist, I Love les Carottes, La Pausa etc. ), but at the moment I really have great time with Hermes Paprika Brasil. So, my vote for the favorite iris today goes to Parika Brasil. I don’t know why I never warmed to PB, but I really didn’t. Sounds like we have very similar iris tastes otherwise. Wow what a beautifully done iris with unexpectedly woven in other rich notes. I plan to buy the full size soon. May be even 2 bottles so I don’t run out!!! Wow, 2 bottles — I don’t love anything that much anymore! Very nice review. Unfortunately this is out of my price range. I wouldn’t turn down a sample though. Iris has a nose-tickling dryness to me. Kind of like inhaling dust. I do own Prada Infusion d’Iris, but I have to layer it under something or wear it on a very humid day to be able to enjoy it. I like Dzongkha on occasion too, but between the iris and incense I can’t identify any notes…So I guess my favorite iris is Apres l’Ondee. I had no idea there was any iris in there until I saw it in Monkeytoe’s comment above. It is such a damp scent. I am totally surprised. I don’t think of Apres l’Ondee as an iris scent either, or at least, not as a primarily iris scent, but there’s plenty of iris — the powder and the earthy bit in the base. I’m going to have to get myself a sample of a vintage and possibly stronger formula. I don’t get any powder from the bottle of edt I bought last Christmas. Although Dionne’s comment below suggests I should smell more iris, not less. I’m usually hyper-sensitive to it. I wonder if another note is blocking it? Lucy- I’m curious about what you layer with Prada Infusion d’Iris. I’ve found that I don’t wear it much anymore and maybe adding another dimension would spark a renewed interest. I’ve had the best luck using it to ground pretty, light, floral, linear-type scents. Orange blossom has been a good one. I have C.O. Bigelow’s Lemon Orange Blossom and Jo Malone Orange Blossom. Both work well. I also tried it with Stella McCartney’s Stella. I liked it, but I like Stella well enough on its own that I prefer not to mess with it. I would think any simple citrus or floral scent would work. I haven’t really found anything that adds more depth to the Iris though. I don’t have one that I know of in my over 200 bottles so where do I start? The signature is something I’ve LONG WANTED to smell. I may even get a full bottle blind. It has love. So what say you friends…which IRIS should I try? Gosh, just look through the comments….lots of great suggestions! I do love Prada d’Iris and have not tried the absolue. Been wanting to try the Nazarena, want to even more now! Iris Silver Mist wasn’t for me, however, probably, yes too masculine for my tastes. Trying to decide if this is more masculine than Iris Silver Mist. It might be. Maybe it’s more of the Luten’s style, idk, I haven’t found much that I like of his. Though, I need to sniff loads more from his line yet. Iris is my all time favorite note, with ISM being an allbtime favorite. The other loves, not necessarily in order: Iris Poudre (it has a dry down to die for), Prada Infusion d’Iris Absolue, Ramon Monegal Impossible Iris, Le Labo Iris 39, Bond No. 9 Silver Factory, 28 La Pausa. As to Iris Nazarena, I tried it in-store a month ago and love it. Miguel gave me and a perfumista friend one manufacturer’s sample each but I have yet to wear it. I am pretty sure I will like it and the bottle has a really nice shade of green (and green is my favorite color). I got Lles Carottes from the first NST Swap and did not like it when I first tried it but I will definitely revisit. I have yet to try the Hermes Hiris and now I must seek out a sample! Hiris & Les Carottes are both Olivia Giacobetti, and they’re both carrot-ish. Some people find Hiris too sharp, I think. Another Hiris fan! I don’t have any in my possession but you’ve reminded me maybe I need to work on remedying that! In meantime I content myself with 28 La Pausa and the Prada, although much more often the former than the latter, if I’m honest about it. Actually I’ll go out on a limb and say I like No. 19 Poudré too. I get why it offends purists–I won’t dispute that it does not fit comfortably into that line of Chanel classics–but as a contemporary perfume I like it a lot. I think the Hiris bottle is perfect. Must also admit that my Hiris did turn, eventually, and so I need to replace mine too. Also, I own bottles of both pre-2011 and post-2011 Après l’Ondée, and while the earlier formulation has heliotrope front-and-center, post-2011 is all about the iris and violet. Still pretty, but there’s a hole in the middle now. I treasure my decant of vintage AlO extrait. Iris is one thing (fig is another) that I either love or want to love, but I have yet to find an individual perfume that really speaks to me. Unlike with fig, however, I still haven’t made my way through all the classics so I still hold out hope, although with every miss it gets fainter. Hey, there are always going to be some notes I don’t love. Just as well, you can’t buy everything, right? I haven’t tried a lot of the irises mentioned here, but I really like ISM, and I love me some No.19, though I think of it more as green than iris. I also really like SL Bas de Soie. I just got a sample of Iris 39, and my initial impression is that I like the drydown, but the first hour or so is a bit metallic to me. But I haven’t really given that sample a really full wearing yet, so who knows, maybe that initial impression will change. I do not love Iris 39, in fact, I don’t even like it — I think of it as “Angie’s iris”, and indeed she does not like most of my iris favorites. I like light touches of iris in blends, but big iris notes quickly overwhelm me. I think this is related to my hatred of chalky textures — chalk dust, nonfat yogurt, etc. — which is related to my hatred of dry textures, like manila paper and particle board, which is related to my hatred of scratchy sounds, like pencils or erasers on paper. All this stuff gives me the chills. (I looked some of it up once and apparently it’s a trait sometimes seen on the autism spectrum. Go figure.) I would be interested to know if any other iris haters have this cluster of dislikes! I think the most iris-y perfume I own/enjoy is Paco Rabanne Metal, which is related to No. 19, but I like it more. So interesting. My son has similar texture-related sensory processing issues — common with adhd as well as autism. My husband likes to write with pencil, and sometimes if he’s scratching away for a while I have to leave the room. It gets to be like nails on a chalkboard for me. I wouldn’t say I’m an Iris hater, but you’ll see above that I called it nose-tickling and likened it to inhaling dust. I don’t get chills like you do, but I strongly dislike every one of the things you mentioned. Do you have the same issue with incense (like I do)? For me, I feel iris in my throat — too much makes me want to cough! I don’t usually have the same problem with incense, but I prefer incense that veers into amber territory. Actually, now that you mention it, myrrh in big doses is kind of coughy and musty too! Forgot to mention…if I wear Dzongkha or Infusion d’Iris on the wrong day, like a dry winter day, I feel the urge to scratch my skin. Wow, Egabbert! I have never thought to link all of those things like you did, but yes! Brilliant! And I totally agree. Maybe that’s why, despite years of sampling, I can’t find an iris to love – except Iris Ganache which is not “dry” in the usual sense, being full of sticky, sweet ganache. Iris Poudre is similarly sweetened up and didn’t smell much like an iris perfume to me, but I still didn’t fall in love. Iris Poudre is a masterpiece, but not me somehow. Haven’t tried it in years though, I should again. I’m not a huge iris fan either. Hated Hiris (sorry). Oddly, I really enjoyed my sample of ISM, which came across as very carroty to me, and therefore sort of fun. Friendly, even – which I know is not the usual sort of reaction to it. Did I long even briefly for more? Nope. I adore No. 19, but it is, I think, the multifaceted aspect of it I love so much: green, floral, iris, vetiver, musk, the bit of leather in the vintage edt. And the backbone of it, too, I love that. I enjoy Heure Exquise, and the new Silences eau Sublime which is more strongly related to No. 19 than to original Silences, in my mind, but again those are green-iris-floral things. I do wear my decant of Prada Id’I from time to time, but I disliked the Absolue intensely. (Bleargh, soapy. On me, at least.) And I adore Iris Poudre, but to be honest that’s more about the aldehydes and the fluffy benzoin drydown than it is about the iris. I tend to get on rather well with most classic Chanels (exception Cuir de Russie), and I attribute that to feeling comfortable with that very-Chanel, austere iris that seems present in so many of them. So: yeah, I like it… but perhaps not as a focus. And forgot to say — first, I enjoyed the review, and second, I’m not surprised you found this one attractive. The first thing I thought when I heard Aedes was putting out an Iris was Oh, hey, Robin will be pleased to try it. Ha, I am soooo predictable, aren’t I? My most-often worn iris perfume is Dzongkha, if that counts. I absolutely hate it in the summer, though. Dzongkha is in a class by itself, for me, anyway. It is an iris fragrance, but I nearly never think of it when I think about iris — I think of it as a cold stone temple fragrance, or just as a Bertrand Duchaufour fragrance. First I want to say that I also wear Hiris – not too often since there are so many other perfumes I love but still. My favorite iris perfumes (I just can’t choose one): Prada Infusion d’Iris EdP (and Absolute), №19 EDT, Le Labo Iris 39, Frederic Malle Iris Poudre, Hermes Hiris, Ormonde Jayne Orris Noir, Armani Prive La Femme Bleue and Ramon Monegal Impossible Iris. Undina, it’s clear we have similar tastes. I need to try some of the irises you mentioned. I love iris! L’AP Iris Pallida is my fav, and I also love Iris Silver Mist, Hiris (my first), Xerjoff Irisss (although I’ll have to make do with decants of that one) and 28 La Pausa. There are probably others such as Heure Exquise that I don’t really think of as iris. To me it’s just a great note. I’m ambivalent about the Prada. It seems appealing at first, but then it soon strikes me as artificial and eerily uniform. Maybe I’m just hyperosmic to the musk and not smelling the whole thing. Any way, your review has really caught my attention, and I’m now looking forward to trying Iris Nazarena. MinNY had all the Xerjoffs at 30-40% off a few weeks back and I was really really tempted to get Iriss but even with the discount, it would still come to almost $500 (I don’t recall the size but even for 100 mLs, it is still expensive. ZOMG! I wish I’d known, or maybe not. I also like the rose one. Even at a steep discount they are expensive! The Xerjoff is lovely. I did my best to forget all about it given the price. Iris Pallida, which I tried for Tania Sanchez’s statement “Stately. Eerie. Quiet.” Well behaved, even at the gym. My 65 year old male trainer liked it! Hi Robin. I like Chanel No.19 and Iris Poudre. But, to tell the truth the iris I wear more than these or any others is Infusion d’Iris edp. I have a decant of the absolue formulation as well and I often blend the two. You are my scent twin, so if you like Iris Nazarena, I must get a sample. The Prada is so wearable…I’ll have to try layering. And hope you’ll like the Aedes then! I love Heeley’s Iris de Nuit. And ISM. My two other faves are Mon Numero 8 and Dzongkha, but they are more ‘adulterated’ irises so I’ve classed them as an aside…….. I keep meaning to review the Mon Numero. One of these days. Disclaimer. I appreciate any fragrance that’s beautifully done. If it clashes with my chemistry I will dislike it on me – while hopefully adoring it on someone else. Iris is not a note that blooms on me. I tolerate it occasionally, especially if accompanied by vetiver, but otherwise I just find cold, even frigid in some creations. I like Infusion D’Iris which I find elegant and well done, but it is devoid of passion. I love vetiver creations and if they contain iris, so be it. Ralf Schwieger, if my memory serves me right, created my beloved Eau de Merveilles therefore I will certainly try Iris Nazarena with an open mind and an optimist nose. But that’s because of Ralf, not because of the fragrance. Yes, he did! And FM Lipstick Rose, among others. No-one has mentioned 31 Rue Cambon yet? How can that be? I like it very much, but reserve it for parties and evening outings in the summer. Chanel No 19 Poudre is good for that too. I’ve worn the original No 19 since my early twenties but wear it far less often now. Infusion d’Iris I have trouble smelling; have not tried the Absolue though. And Heure Exquise! Has been mentioned a few times, but deserves another shout-out. Thanks for the review of Iris Nazarena. It’s out of my price range, but its good to hear that great iris fragrances are still being produced. Interesting — I really don’t think of Rue Cambon as primarily an iris. But maybe everybody else does! I would love to smell this one! Hiris and Iris Silver Mist are also on my to-try-list along with Heeley Iris de Nuit. I am intrigued by iris and love to explore its facets, although I am often disappointed and find the scents too tame. My favourites so far are FM Iris Poudre and Infusion d’Iris Absolue. I love Absolue because on me it is much warmer than other iris scents. I also enjoy the regular Infusion d’Iris and Donna Karan’s Iris, although it is very lowkey. Furthermore I appreciate iris as a team player in Dzongkha, Dior pour Homme and Shalimar Parfum Initial. Ack, I can’t remember the Heeley at all — I know I’ve tried it. Shalimar PI smelled like a straight up iris soliflore to me. I wore Iris Nazarena yesterday, and it started out very bland, got a little more interesting in the dry down, then ultimately became all about vetiver. I think you found it more assertive than I did – on me it was very subtle, almost no sillage and I kept having to put nose to wrist in order to really discern it. I’m pretty underwhelmed by the fragrance. I love so many fragrances that have iris in the composition, but my two favorites that I consider to be “straight up, all about iris” scents are L’AP Iris Pallida and VC&A Bois d’Iris. Interesting — but $ saved, right? Definitely! Glad it wasn’t #562 on page 3 of the ever expanding wish list. No one listed my favorite iris – Guerlain Iris Ganache. You probably hate it, Robin! I keep looking for an iris to wear in warm weather, but without the dreaded (for me) musk. So far there are a few I like, but they’re not big loves: Hiris, Les Carrottes, and Equistrius. Equistrius reminds me of Ormonde Jayne’s Orris Noir, another one no one has listed!. I also should have said, great review, Robin. Thank you as always. Oh, Orris Noir! I *do* like that one! But for me, it is all about the spices and that wonderful, woody OJ base. I barely notice the iris in that one, which is probably why I like it! Same here — I like that one because it’s barely iris-y! Also it smells like a friend of mine. Of course I hate it!! Oh, Iris Ganache is a good one Rapple! I bought a split unsniffed – something I would not do with anything but an iris. For the first couple of hours, I love this scent. I get tons of carrot up front for the first few minutes, and then a luxurious iris for an hour or two. But then it turns decidedly more masculine and I lose the irissy softness as it settles into incense and woods on me — and sadly, I do not enjoy woods. I am still getting to know this fragrance, but I don’t think it falls into my true love camp with Prada, VCA, and Hiris. Next time I wear it, I may try layering some Prada with it on the drydown. Oh, too bad. Glad it was just a split, then. I like No. 9 and love Apres l’Ondee, but I don’t think of either one as an iris. Bas de Soie is my favorite that I think of as iris. I can’t smell Infusion d’Iris at all. I thought iris was a favourite note but then I found too many irises I disliked! Iris Ganache which I thought I would love was actually a scrubber, as was Bas de Soie (dirty pantyhose). Infusion d’Iris Absolue just unpleasant, CvA Bois de Iris which I liked enough to get a decant of has turned out too languid, sweet and limpid. No. 19 is too brisk and bitter while Iris Poudre is somehow too mannered – like some member of the ‘gentry’ who always looks down on those of a purportedly lower class! On the other hand there is Heure Exquise, refined, and structured but graceful too. I think I need some – just for when I’m in a pearl-wearing mood. Perhaps twice a year! Infusion d’Iris EDP was my ‘gateway iris’ and I find it wonderfully distinct. Nuit d’Iris, if I remember right, was softer and more romantic, like a wash of purple colour in an impressionist painting. And I swear I smell a touch of iris in my great love affair with Chergui! By the way, I know iris is supposed to be quite cerebral – but does the picture remind anyone else of the human brain? Oh, it sort of does! I actually saw it as an elephant of sorts. Had to struggle to see it as an iris. Hate to think what that says about me…..
Iris Ganache was pretty much a scrubber on me too. Lol! Anyone else find iris poudre stuffy? I like Iris Poudre – it feels like a lovely old Chanel formulation that never was – old-fashioned in its way. But for some reason I never get the iris component much. Have you tried Bvlgari Omnia Amethyste?